A Very Merry Cricket isn't the easiest thing to explain. For starters, it's a sequel to an animated adaptation of the children's book The Cricket in Times Square. Both specials were made by Chuck Jones, the Looney Tunes guy. You may also remember his work on another Christmas Special How the Grinch Stole Christmas. 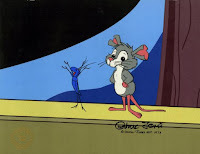 From what I can gather, in the first special a Connecticut cricket named Chester ends up in New York and eventually becomes famous for his ability to play music. In this follow-up, Chester's old pals Harry and Tucker go to Connecticut to bring Chester back to New York so that he can play for the city folk and remind them to be kind to one another, or something like that. There really isn't a whole lot that happens during the special. It's definitely worth a watch if you're animation fan though. A lot of the animation is of the Looney Tunes variety (including some voice work from Mel Blanc) but it's combined with some distorted city imagery and grotesquely painted backgrounds that reminded me a lot of the work of Ralph Bakshi.